In this video, we show a demonstrator of brix estimator for tomatoes. Brix, related to sweatness and flavour is an important quality indicator for different types of fruit. 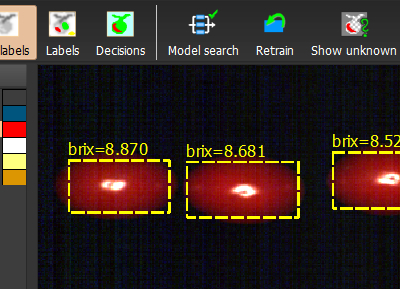 We have used a data set from Wageningen WUR, our long-term customer, to design algorithms detecting tomatoes and measuring their brix from a hyperspectral image. This solution can be deployed using perClass runtime technology and embedded in an industrial process. Contact us at info@perclass.com for details.